When did NASA actually have the technology to digitize and manipulate their imagery data and what classified applications did they use to produce the final product that was shown to the public ? This thread will be an (ongoing, work in progress) attempt to answer some of these questions by displaying and examining parts of the available evidence from the time period of the the Apollo missions and early space program that was public information or declassified. Before an image can be processed, it must be put into digital form. Frederick Billingsley and Roger Brandt of JPL devised a Video Film Converter (VFC) that could transform analog video signals, such as those sent back by Ranger spacecraft, into digital data. While they supervised the construction of the device, John Morecroft of JPL used the NCR computer to begin programming processing algorithms. These events took place in 1963, and by the next year Howard Frieden had programmed the Laboratory's institutional IBM 7094 computer to process Ranger data. Success with Ranger images led the Surveyor project to use Nathan's techniques, as well as Mariner Mars 1964. By the Mariner Mars 1969 missions, the concept of digital image processing was fully accepted. VDPS - Video data from spacecraft photographic mission telemetry is scanned to generate digital tape computer program which prints out intensity points, cleans noise and telemetry drop-out, enhances contrast, modifies the picture, and calculates contour lines. The output is converted into new photographic film. Publication Date: Dec 1, 1967. "That paragraph all by itself confirms the capability of digital scanning frames of film, manipulating them, then OUTPUTTING THE MANIPULATED VERSION BACK TO PHOTOGRAPHIC FILM! Those are the three primaries required to begin pulling the imaging scan off digitally. What NASA claims is *ahem* "raw" film is nothing of the kind. It is exposed film that has been scanned, manipulated digitally, then spit back out on photographic film to appear like it is "raw" "
That's a good question, and an important one. Back in August of 2010, LunaCognita sent me a 10-page draft of an article he was working on, titled "NASA's Early Digital Image Manipulation Capability". Even though this article is a rough draft and not complete yet, it does start to demonstrate that people who think NASA did not have any digital image manipulation capability back then are completely wrong in that belief. It is scary subject matter, because it forces people to realize that NASA has, since their earliest days, had the digital capability to alter their space-based imagery via computer, which of course means they had the capability to "photoshop" any imagery they wanted. Scary stuff! It's an interesting read, and I have been able to verify most of the sources. I am posting the draft article below (in pieces, for clarity) - along with the images and document links I managed to track down. For the record, I want to make it clear that I did not write this myself - I am providing LunaCognita's observations "as is" for everyone to consider. Personally, I think there is a lot to learn here, but that is my opinion. In order to even begin to really understand and appreciate the level of manipulation, obfuscation, and fakery that the Apollo public archive image and film datasets have been subjected to, one first has to appreciate even the declared level of digital image processing and manipulation technology that NASA/DoD publicly admit to having access to back during the Apollo program that would have allowed them to sell their own special perception of reality to the unknowing and trusting public. It seems that many people still hold a belief or assumption that there was simply no way that NASA/DoD or anyone else had the technological capability to alter Apollo photographs and film footage back in the late 1960s and early 1970s using digital methods, and they dismiss any possibility of these "photoshopping" techniques being available back then as laughable conspiracy theory. They believe the kind of technology required to digitally scan and manipulate Apollo imagery and footage by computer just was not around in the days when the Apollo crews were journeying to and from the Moon. 1966. It was way back in 1966 that the good people at NASA's Jet Propulsion Laboratory-IPL (Image Processing Lab), led by image processing pioneers like Robert Nathan and Fred Billingsley, first went public with JPL's "extensive special purpose software system" known as VICAR (Video Image Communication And Retrieval). To quote NASA directly, "VICAR is an entire system of software, formats, and procedures for image storage and processing". NASA's own VICAR User Guide tells us that "The VICAR image processing language was defined by JPL employees Stan Bressler, Howard Frieden and Fred Billingsley, and implemented in 1966 at the Jet Propulsion Laboratory to process image data produced by the planetary exploration program. The software package was originally designed for operation with the IBM 360/44 Programming System (44PS) and was later modified to run with the IBM OS/360 operating system." Here is how one of VICAR's developers, Fred Billingsley, described the early digital image processing technology. Billingsley made this quote during the Apollo Program in May of 1972. "In recent years the modern digital computer has been used to process images, to emphasize details, to sharpen pictures, to modify the tonal range, to aid picture interpretation, to remove anomalies, and to extract quantitative information...computer techniques may be used to emphasize details, perform analyses, classify materials by multi-variate analysis (usually multi-spectral), detect temporal differences, etc. Digital processing may also be used to modify various aspects of pictures to enhance the ability of the human photo interpreter in extracting information." Volume 5, Issue 2, April 1973, Pages 203-204, IN1-IN27, 205-214. Received 31 May 1972, Available online 15 August 2008. Before getting any deeper into discussing early digital image manipulation and computer processing techniques that NASA was admittedly exploiting even prior to the Apollo Program, it is very important to always keep in mind that the methods we will be touching on here were typically officially presented/acknowledged by NASA/JPL as being exploited to digitally "enhance" or "correct" early satellite/planetary probe imagery. Of course, there is no doubt that these digital tools could be and indeed were used to improve the quality and clarity of downlinked space imagery. However, always remember that ANY of these digital "enhancement" techniques that could "emphasize and improve detail" could also by default be used just as easily in the opposite fashion for malevolent reasons - to remove or alter detail for the purpose of obfuscating rather than enhancing. This is a simple and irrefutable fact that must be appreciated, because NASA and the DoD are NOT idiots, and when discussing this subject matter in their early documentation they were not prone to blatantly highlighting any of the "dark side" potential this digital image manipulation and enhancement capability also brought to the table. To anyone reading early documents about this amazing technology, NASA was instead sure to convey the impression that they were exploiting it only to clean up and enhance the truth contained in the raw imagery, not to hide or "sanitize" anything from the public. The idea of photographic manipulation and "enhancement" is essentially as old as the art of photography itself is. Forget the idea of old-school "scalpel and airbrush" techniques done by hand like the Russians under Stalin were famous for (https://en.wikipedia.org/wiki/Censorship_of_images_in_the_Soviet_Union). Debunkers want people to think that is all that NASA had in their obfuscative arsenal back in the late-1960s and early 1970s, but the truth is that Apollo was all about manipulation and obfuscation in the DIGITAL realm. The purpose of this specific article is merely to attempt to begin correcting the common misconception many people still hold that NASA (and the DoD and intelligence agencies) did not have digital image manipulation capability back during the Apollo Program that they could have exploited to help hide the truth from us. JPL's VICAR system did not signify the birth of digital image processing technology by any means, but it was one of the first publicly declared systems that was designed specifically to allow for various general purpose application programs to be created, loaded and used as required in a modular fashion, with different modules being designed to carry out different specific image processing tasks. (d) a large number of general purpose applications programs that can be utilized as modules in constructing processing sequences for one or more images. Again though, NASA/JPL and others already were admittedly developing and using digital image enhancement and manipulation capability prior to the VICAR system's public debut in 1966. 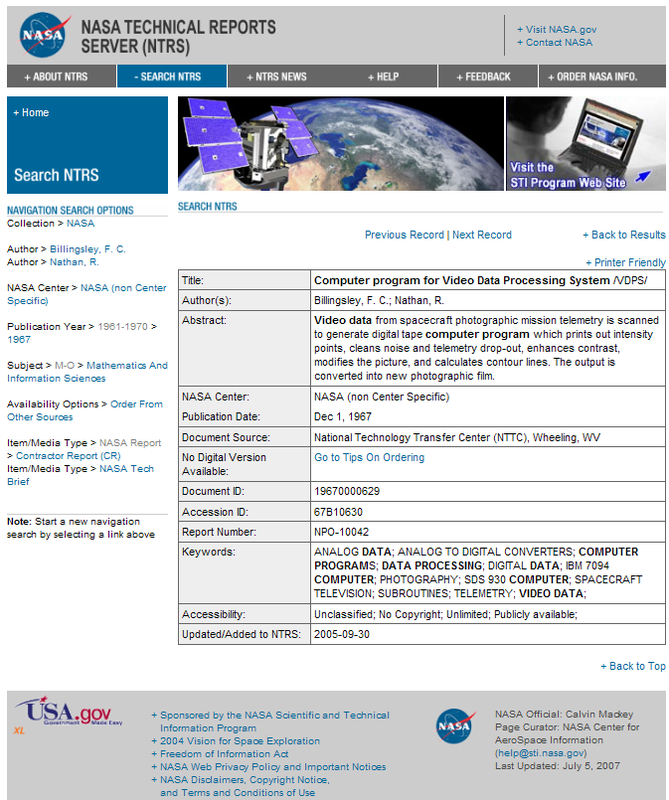 Digital Video-Data Handling methods were employed by JPL-IPL on various Ranger unmanned lunar probe imaging datasets for example even before 1965, as well as on the early Mariner-series planetary probe image datasets from that era as well. 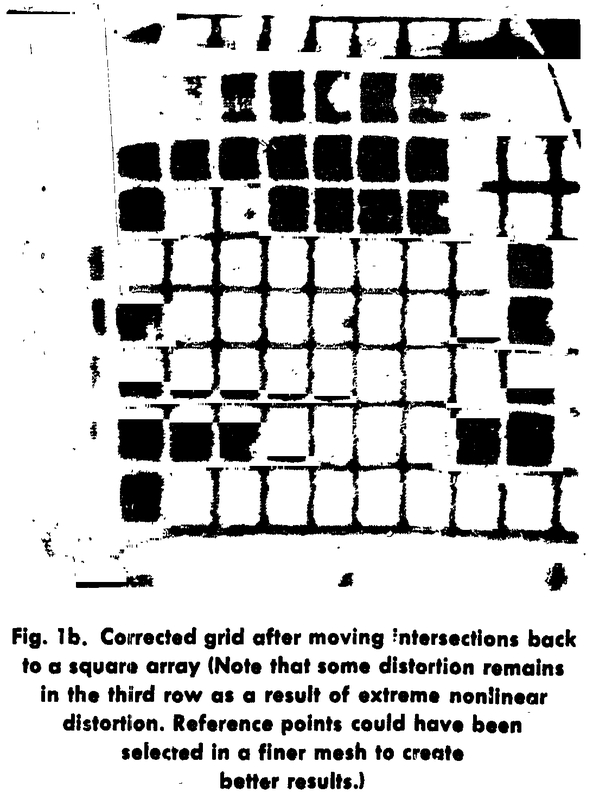 In a document he wrote in 1965 titled "Digital Video-Data Handling", here is how JPL's image processing guru Robert Nathan briefly described this digital capability that was already being exploited at that time to apply a variety of "corrections" to pre-Apollo unmanned NASA space image datasets. "A technique has been developed which makes it possible to perform accurate, detailed operations and analyses upon digitized pictorial data. Television pictures transmitted from the Ranger and Mariner spacecraft have been significantly improved in clarity by correcting those system distortions which affect photometric, geometric, and frequency fidelity. Various classes of structured noise have also been detected and removed digitally by means of newly devised two-dimensional filters. Although mathematically the filters are easier to describe in the frequency domain, they are more effectively applied as a convolution operation on the original digitized photographs. The cleaned-up, enhanced pictures are then used by the computer for further interpretive and statistical analyses." (*1) From: "Digital Video-Data Handling" (NASA-JPL Technical Report 32-877) by Robert Nathan, January 1966. Back in 1965 (and even earlier), Bob Nathan and a host of others were admittedly already digitizing analog video signals and exploiting digital image manipulation technology, applying a variety of digital "corrections" to Ranger and Mariner (then Surveyor and Lunar Orbiter) unmanned probe imagery using various computer systems, all before Apollo went to the Moon. Here are a few examples taken from the same 1965 document referenced above written by Bob Nathan that help demonstrate a few important facets of JPL's digital image processing and manipulation capability that was being applied to space image datasets back then, even prior to the VICAR system being publicly debuted. Unfortunately, as is the case with the vast majority of early NASA archive documentation, the picture reproductions contained within those documents typically rate in quality/resolution as being somewhere between "poor" and "horrible", in some cases even to the point of the image examples showing the manipulation and enhancement effects being simply useless to try to interpret at all. These following image examples have been faithfully copied from the PDF version of this document, and while the reproduction quality definitely leaves much to be desired, the captions Bob Nathan wrote for each still prove to be most informative. Fig. 1a. 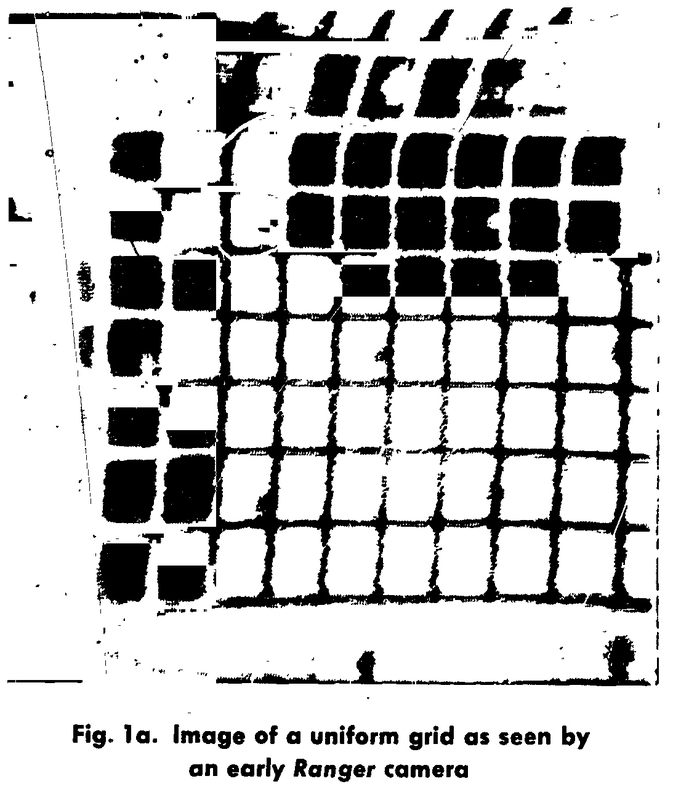 Image of a uniform grid as seen by an early Ranger camera. Fig. 1b. Corrected grid after moving intersections back to a square array. This initial "before and after" example that Nathan is showing is of the typical Ranger-series camera's uniform grid pattern, using it as a very basic visual demonstration to first show their capability to digitally apply a geometric distortion in a transmitted image from a space probe, with the grid pattern allowing for the original distortion and the subsequent corrective geometric manipulations to be easily visually identified. 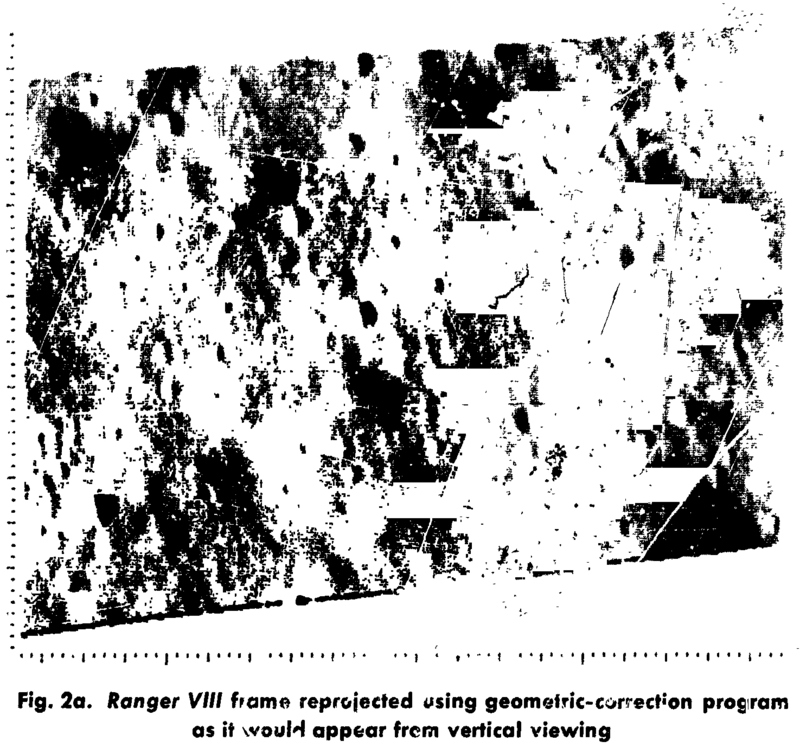 In this next example from the same document, Nathan applies this same type of digital geometric distortion principle to a raw frame from the Ranger VIII mission (Feb, 1965). Note that the document does not provide the original raw Ranger VIII frame that this enhancement was built from for comparison, but at any rate, while this again is a very poor quality image reproduction, Nathan's brief caption attached to this "corrected" image should not be overlooked, because the specific geometric manipulation he is demonstrating would prove to be absolutely vital to both the real enhancement/corrective efforts as well as to the "sanitizing" protocols applied to their public archive imagery as well. Fig. 2a. Ranger VIII frame reprojected using geometric correction program as it would appear from vertical viewing. "...as it would appear from vertical viewing." So, what does that mean exactly? It means that they had the capability to take a raw image and geometrically distort it, altering its perspective via computer in order to make that raw image appear like it was taken from a different location showing an apparent different perspective of the surface. 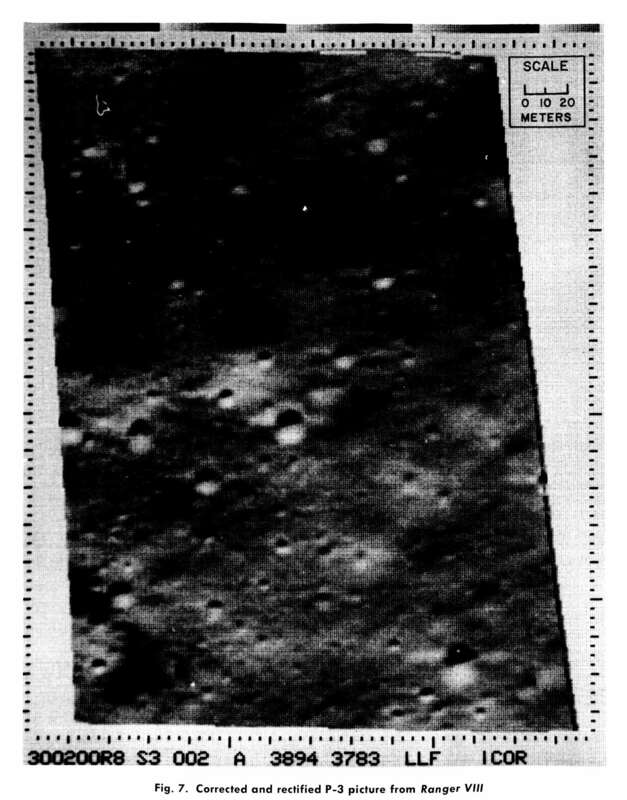 In Nathan's example here from the Ranger VIII dataset, he has "corrected" what was originally a raw image showing an oblique angle view of the lunar surface, digitally altering and re-projecting it so that now it instead appears to have been taken from directly overhead looking straight down (nadir). (*2) Editor's note: unfortunately the original link no longer works, and I have not been able to find this image. (*3) Editor's note: this is one of LC's own images, and I don't have a copy of it. The point of these last two (missing) images however, is clear enough: nowadays even free image processing software like GIMP includes basic geometric and perspective correction applications, and those are simplified examples of a process that NASA was already using back in the sixties. Now, in this example above that I did with the JAXA image, my geometric correction was built from a very basic four-point distortion, whereas even back in 1965, JPL-IPL had the ability to compute geometric distortion parameters for each image with the aid of digital topographic/elevation datasets that were also being built from the raw imagery. 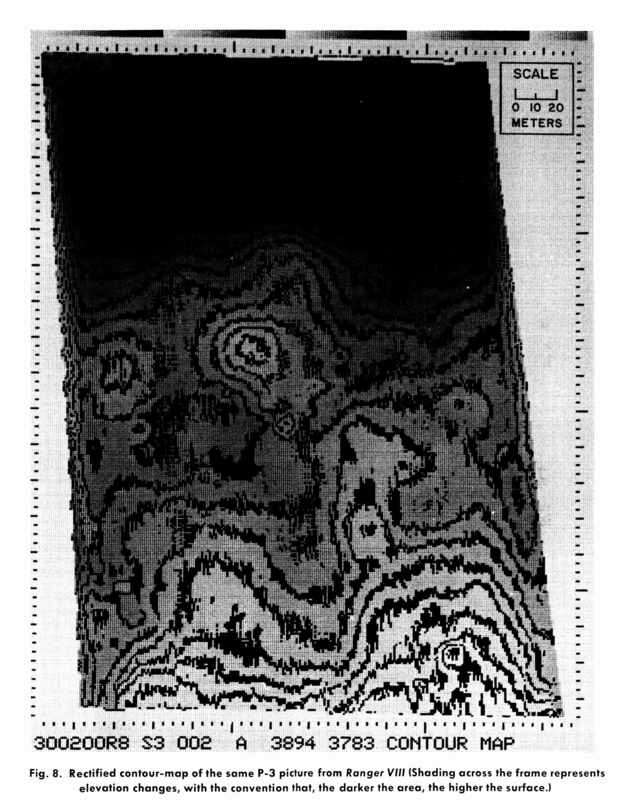 Here is the same Ranger VIII geometrically-corrected image example along with it's digital contour elevation map built from brightness-to-slope calculations by NASA in 1965. Fig. 2b. 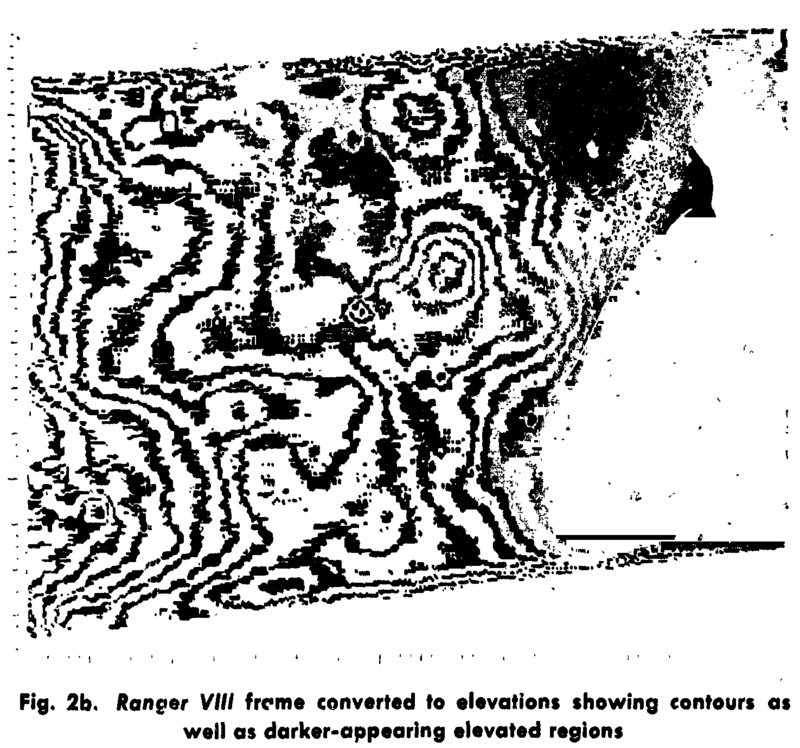 Ranger VIII frame converted to elevations showing contours as well as darker-appearing elevated regions. (*4) From: "A Photometric Method Of Deriving Lunar Topographic Information" (NASA-JPL Technical Report 32-786) by T. Rindfleisch, September 1965. Fig. 7. Corrected and rectified P-3 picture from Ranger VIII. Fig. 8. Rectified contour-map of the same P-3 picture from Ranger VIII.